Jeju-do (aka Cheju-do or Jeju Island) is South Korea’s top island attraction. It is commonly referred to as “Island of the Gods”. Others call it “Little Hawaii” or the “Hawaiian Island of South Korea,” while still others refer to it as an island for “wind, rocks and women”. The island is South Korea’s windiest and wettest province. Its official name is Jeju Special Self-Governing Province. Located in the Korean Strait to the south of the Korean Peninsula and near Japan, Jeju-do attracts so many local and foreign tourists for its amazing land formations, natural attractions and national heritage, as well as unique local festivals, exotic island dishes and friendly locals. This volcanic island is blessed with lush forests and the looming Mount Halla at the center. The mountain is teeming with rich and unique flora and fauna, which is why it has been designated a UNESCO World Heritage Site. Jeju-do is popular all over the world for two other UNESCO World Heritage Sites: Seongsan Ilchubong and Manjanggul Lava-tube. Seongsan Ilchubong or “Sunrise Peak” is a 600-meter wide and 90-meter high volcanic crater whose cliffs rise up vertically from the shore. It was declared a Natural Heritage Site in 2000. Manjanggul Lava-tube, on the other hand, contains stunning lava formations including the world’s largest lava column. It is a 7-km long lava tunnel and is regularly visited by tons of tourists. Tourism has grown tremendously in recent years. As more and more foreign tourists arrive, the provincial government has put up several English-speaking facilities, including hospitals and information centers. These tourist-friendly establishments offer translations in English, Chinese and Japanese. Majority of the locals, however, speak Korean only. The Korean name “Cheonjiyeon” for Cheonjiyeon Waterfall is made up of two words, “ch’eon”, which means “sky”, and “ji”, which means “land”. Cheonjiyeon Waterfall is found near Seogwipo Port. Tourists who wish to visit Cheonjiyeon may travel from the Jeju International Airport to the Jungmun Resort Complex through Seobu Tourist Road, then to Jeju World Cup Stadium and finally to Seogwipo Port. Surrounding the waterfall are two small dams to regulate water level, large volcanic rocks that form land bridges (popular spots for tourist to take pictures), a landscaped trail, a traditional Korean raft called “t’e-u” (a symbol of Korean culture), a pond teeming with koi fish and marbled eel, garden of subtropical plants and diverse flora and fauna, which include migratory ducks. The waterfall is also quite popular at night as it is illuminated with romantic lights. The lighting effects reveal a “Hidden Face” on the formation of rocks. 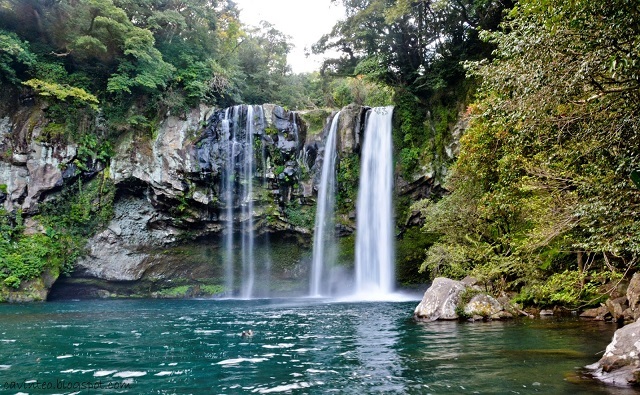 If you are a fan of waterfalls or if Cheonjiyeon Waterfall had just made you one, you might want to check out two other cool waterfalls in the island. They are Cheonjeyeon (not to be confused with Cheonjiyeon) and Jeongbang waterfalls.